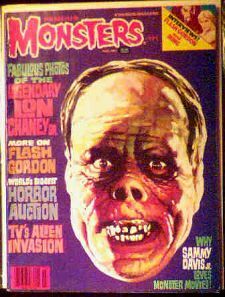 March 1981 issue of FM with classic Lon Chaney cover. Features articles on Chaney, plus Flash Gordon and more. Excellent to near-mint condition. Lon Chaney was the most versatile actor of the silent era. He did all of his own make-up (later forbidden by the unions) and played everything from the Phantom of the Opera to a Marine Corp Drill Sergeant (in Tell It to the Marines). He only made one talkie (a remake of The Unholy Three) and died before he could make Dracula, the role that made Bela Lugosi a star. Website design and hosting by Sohodojo Business Services. Item 145 of 466 items displayed in viewer. 0 items in cart.